Black Pudding and Hops is a long awaited post for many and it hasn’t come any sooner. 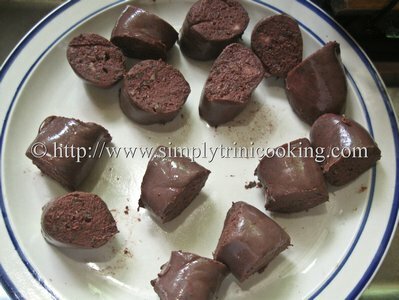 For this post I’ll have to regress a bit and explain how black pudding was made long time. For almost a year, piglets would be kept in pens until they are big enough for slaughter around Christmas time. That was a joyous occasion to have a little pork on the table. Fed scraps from the table along with feed, the pigs matured quickly in time for Christmas. As soon as the pig was slaughtered and the blood started spewing out, it would be caught in a basin with salt added to prevent clotting. The pig’s intestines would be washed out with a hose, turned inside out and prepared for the blood, which would be further seasoned with fresh herbs such as chadon beni and of course the main ingredients for this, chive. Yes, chive is the main man in this recipe because of the taste it imparts on the pig’s blood. Other ingredients include bread crumbs, onions, celery, parsley, cinnamon and perhaps a little pepper to taste. 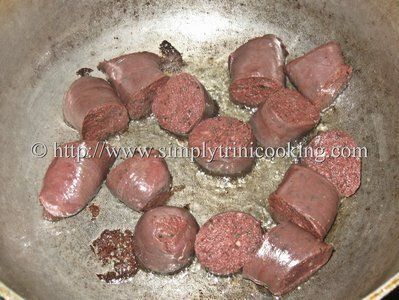 I remember once eating some black pudding from down Madras (in Trinidad) made with massala in it. Tasted very nice! Actually salivating thinking about it lol! After the intestines were filled with the blood they would be tied into sections and boiled. Special care were taken during this process since the gut had a tendency to burst if it came into contact with the pot. To solve this problem a bit of straw was placed at the bottom of the pot. No need to wait until Christmas morning to have some black pudding and hops anymore. As you would see from the pictures below. I really had a ball… the pudding was already spicy, but I still added some more pepper and dressed my hops bread with lettuce and tomatoes – not too much because I just wanted to taste that spicy black pudding above everything else. Wash the black pudding. Set aside. 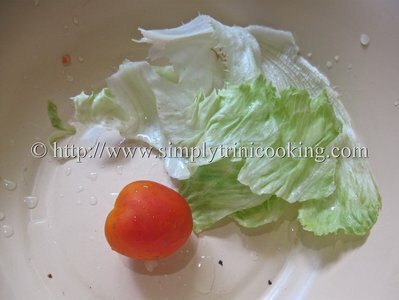 Wash the lettuce and slice the tomato. Set aside. Then add the pudding to fry. Add more pepper if desired. 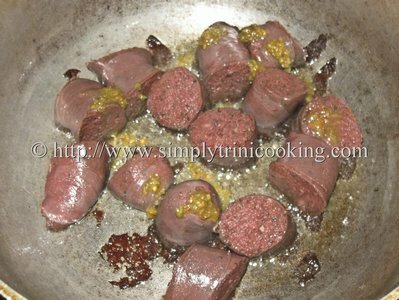 Make sure the black pudding is thoroughly cooked on both sides. Add to hops bread. Dress with lettuce and sliced tomato of whatever you may desire. Stick olive on top of bread using a toothpick. 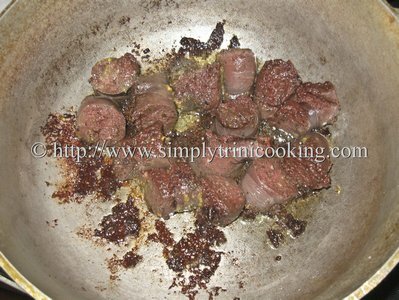 Note: When the black pudding is cooked it turns to a dark red to black colour as seen in the picks. Coming up next …..something with vigour and vitality to wash all that black pudding down…and is not Sea Moss. I wonder what it is hmmm! Enjoy. 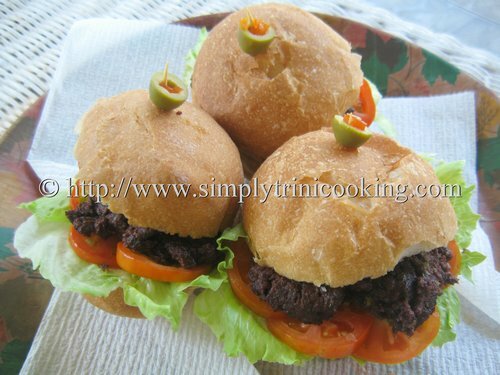 Leave some comments about this black pudding post or drop by my fanpage where the lime continues. 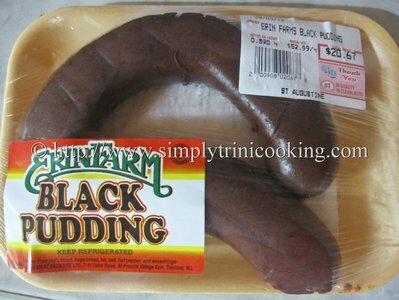 Have to definitely try some Trini black pudding the next time I am in your neck of the woods. I like your style of cooking and recipes, however, when I was about 16, that was about 60 years ago, I knew a gentle butcher in San Fernando market, who made and supplied “black pudding” to some of the top hotels home. (my brother was his apprentice). Why was his black pudding real classy??? (1) use beef blood. or a mixture of beef and pork bloods. (2) (I know it is sometimes the habit of adding ‘chopped up’ pork fat), however, try adding the ‘fat’ as a rendered liquid. no lumps needed. (3) together with the herbs you use, add a heaped tablespoon full per gallon of the ‘raw liquid blood/bread’ —- and this is what made Mr Sonny Thomas’s masterpiece—- ground SPANISH THYME. I realize that it was more than 60 years ago but I have tasted black pudding from many countries. some of them has been rely great. I am still, Sincerely Honest when I tell you they are all a poor substitute, even for Charlie’s Pudding, which was made by his wife in Broadway, near where the cemetery is situated. —- and in my ‘humble estimation’, Sonny’s was the best. Please, comment on your trial, effort and results. Now, was i right or what??? Incidentally, we get black pudding at Wegman and Pricerite in Rochester, NY. 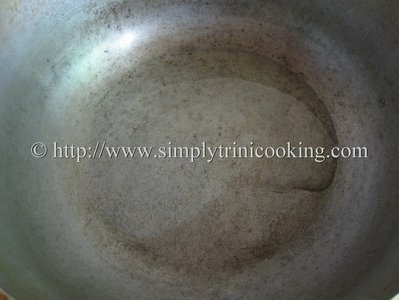 It is not as seasoned as trini’ style, but I add my regular and spanish thyme together with any thing missing. wherever you are in Canada or US, try google: “where can I buy black pudding locally” will usually bring up an address. looking forward to more beautiful foods from the west indies. Freddy Pedro (originally from St Clements, Trinidad. Ah tellyuh dat look reel good, I eh have dat in a long time, because ah livin here in los angeles, post d recipe fuh d puddin nah????? please!!! You can call Charlie’s Pudding in La Romaine, San Fernando, they have family members who provide the pudding with the same Charlie’s recipe in both Toronto and New York. Charlie’s is is the Trinidad Yellow Pages. They will definitely hook you up. From S.Kitts living in the U.S. this post was a sight to behold that takes me waaaaay back to my childhood growing up and eating Black Pudding and Goat Water. I’d never thought I’d ever see an actual recipe. But I remember my Granny used to make both Black Pudding and White Pudding (Without the Blood). I don’t think I can find this around where I live here in U.S. But as a kid I used to have to help kill some of our family Pigs and Cows as other animals. Used to have to hold the pan or basin to collect the blood when we killed the bigger animals so we could eventually use it to make the pudding. Used to be real spicy too as I watched my grandmother make everything. But I was a kid and didn’t pay all that much attention to the actual recipe of the Black Pudding. For variety she would also make some White Pudding since we had lots of stuff to use. I grew up. in Trinidad in the 1960’s.my parents were European World War 2 refugees and I was born in Venezuela. I remember, I was a little boy, going to the Savannah during the horse races betting 1 or 2 dollars on horses trying to pretend to be a big boy like my brother and cousins. my cousin talking to eat black pudding without knowing what it was. And I came to love it’s so much that I didn’t care that it was blood.today I live in the United States. I have no access to Trinidad black pudding. But, the Argentinian community here have brought us their version, Morcilla. I really avoid reading the labels because I don’t much care to read about blood. But I suspect that the Argentinian blood pudding is made with beef blood. And I still enjoy it as much as ever.it brings back beautiful memories of a beautiful island beautiful people and wonderful food.even today I still think of Trinidadians as being the nicest people in the world.